When most people think of the challenges of vaccine development, the first thing that enter their mind is the serial passaging of a microbe to weaken it, the search for a microbial protein to prime the immune system, or the large clinical trials needed to show efficacy. What is almost taken for granted, in the modern era, is the ability to find suitable cells to grow the microbe in (for viral vaccines) and produce the vaccine in. 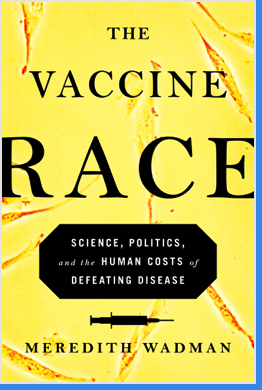 The Vaccine Race: Science, Politics, and the Human Costs of Defeating Disease, a new book by Dr. Meredith Wadman, provides an exciting narrative that describes the intricacies of the development of one such cell line that has been employed to vaccinate millions upon millions of humans and contribute to their flourishing. The chief subject of Wadman's book is Leonard Hayflick, a scientist whose name is familiar to any student of biology as it was his work that demonstrated the limits of cell division -- their "Hayflick Limit" -- as their chromosomal telomeres shortened. However, that is just one thing Hayflick discovered. He is also responsible for identifying Mycoplasma as the cause of "walking pneumonia." However, the main thrust of this book is focused on understanding Hayflick's cell line WI-38, derived from an aborted Swedish fetus, that became the standard research cell line used in vaccines that range from measles to polio to rubella. Such a cell-line, because it was human derived, removed concerned with contamination with viruses such as the infamous tumor-virus SV-40 which was harbored by rhesus and cynomolgus monkey kidney cells. In telling this story, which if full of giants such as Hayflick, Stanley Plotkin, Joseph Smadel, and Hilliary Koprowski, the founding and development of the Wistar Institute is also explored in great detail as is the business of scientific research, interactions with pharmaceutical companies, controversial clinical trial design, the intellectual property rights of scientists, and controversies over using vaccines grown in fetal cells. It is hard to encapsulate all the information contained in this notable book (and there is some controversy -- see Hayflick's list of inaccuracies he identified) but it is required reading for anyone who wants to understand the fight against infectious disease, the history of medicine, and the life-saving role of vaccines.